If there is someone in your life who has recently moved into his or her own home, buying gifts should be a no brainer. The first time homeowner is going to need a long list of items to get their house into fighting shape and keep it that way long term. More importantly, with that big down payment draining the coffers, the new homeowner in your life is going to be on a budget. Think of all the tools you bought as needed that first year you lived in your house. There are some odds and ends you likely hadn’t even heard of before they were needed. This is the natural progression of putting together a solid collection of tools capable of serving any job that pops up. But this progression takes time and money. This holiday season, is the perfect time to give the homeowner in your life a jump start on a great basement, shed, or garage stocked wall to wall with the tools and materials they’ll need to get ‘r done. In this article, we’ll outline the fundamental five things everyone needs but won’t quite buy for themselves when they move into their first home along with practical uses, and links to purchase. No matter what project you are taking on, it is extremely probable that you’ll need to fasten or drill. Cordless drills do both at a much quicker and more efficient speed than those old hand tools that are passed down through the generations. While nearly every tool brand has a line of 18 volt, cordless power tools, they can still be a little bit pricey, especially for the brand new homeowner who is keeping close tabs on their wallet. That said, this is the perfect holiday gift for any budding fixer upper. 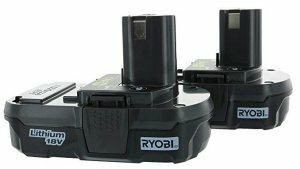 We’ve linked the Ryobi, 18V combo pack above. Certainly, you can buy just the drill, but the added value of the drill/impact driver set is almost too good to pass up. Plus, everyone knows that once you use a driver to latch down a screw, anything else fails in comparison. Even with your brand new drill, the new homeowner is definitely going to encounter tight spaces and screw types they just cannot get to with a full-sized, cordless gun. Cue the multi-tool. We love the multi-tool because it is the gift that keeps on giving. It used to be that you could get by with a 2 or 3-in-1 tool, but these days, ready made furniture fasteners are so specialized, it is almost a necessity to have a good stock of standard and odd ball screw heads, like hex and nuts. 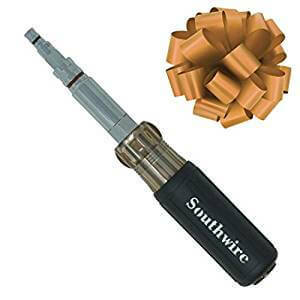 Rather than 11 full sets of screwdrivers, most of which get lost, or are so oddly sized they’re never used, look to gift a multi-tool like this one from Southwire Tools & Equipment. Much like the multi-head screwdriver, the adjustable crescent wrench limits the amount of separate sized wrenched one needs in one, easy to use implement. The adjustable wrench allows the user to spin the coil at the center of the wrench head in order to open or close the jaws to fit whatever size bolt needs loosening or tightening. That said, these are not necessarily one size fits all. 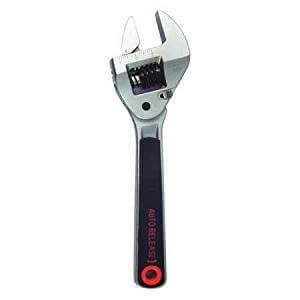 The new homeowner in your life may need a couple general sizes of adjustable wrenches,, one for really big bolts and one for smaller bolts. If you are feeling really generous, you can look to gift a self ratcheting version of the adjustable wrench, like the one above. These are great because you can tighten them without the guess and check game that ensues each time you remove the wrench to give an incremental spin on the jaws. 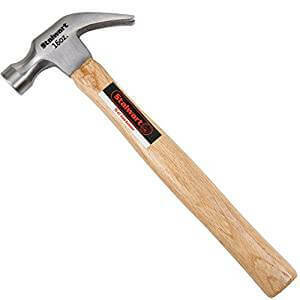 The hammer is probably the one tool that everyone can identify. What is less widely known is the fact that you probably need two to get your tool kit started. Why two? Hammers are categorized by their weights. Using a lightweight hammer on a heavy gauge nail is nightmarish, and visa versa. 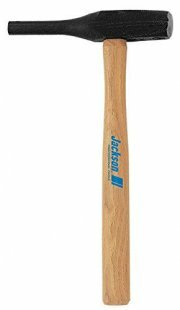 For the new homeowner in your life, wrap a bow around a basic claw hammer for construction projects, and a pin hammer for small pins and nails like those used to hang picture frames. What good is that new drill set, hammer set, and multi-tool without a solid collection of fastening hardware? 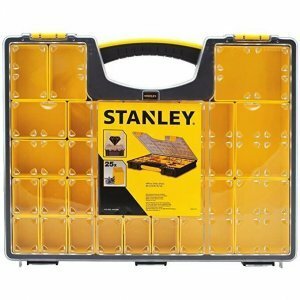 We suggest stocking a hardware container, like this one from Stanley, with an assortment of types and sizes, from 2 inch construction screws to tiny brad fasteners. So there you have it: the five essential tools every new homeowner needs this holiday season! Certainly there are more, but most can be handed down from the collection you’ve accumulated over the years. Those listed above are the types of tools each person should own new and make their own. Add in a short tutorial in between holiday courses, and you will have given the best gift of the year.